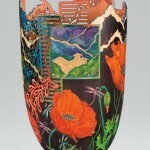 Contemporary wood artists are letting their medium escape from functionality and traditional craft concepts into realms of pure form, texture, and color. 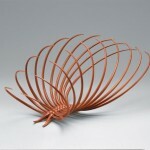 Brad Sells, Whirl, 2003, cherry, 19 x 30 x 18 inches. If any further proof were needed that the use of the word “wooden” in the sense of stiff, awkward, or inexpressive is one of the most ridiculously inappropriate metaphors in the English language, it currently can be found, in quantity, at the Peabody Essex Museum in Salem, Mass. 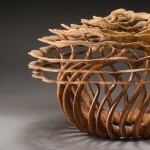 “Audacious: The Fine Art of Wood, the Montalto Bohlen Collection,” on view through June 21, showcases more than 100 works in the medium of wood by contemporary artists who have left the traditional role of craftsman or cabinetmaker far behind, just as their works leave wood’s time-honored role as a utilitarian material far behind. Some of the pieces in “Audacious” are simple and understated, like David Ellsworth’s smooth, conical Vessel (1979) or Bob Stocksdale’s almost Zen-like bowl Mahoe From Key West (1996), but most are in-your-face virtuosic, certain to make all but the most hard-core aficionados of contemporary wood art wonder, “how did they make wood do that?” In Ron Gerton’s A Tree Runs Through It (1998), a closed, turned-wood vessel appears to have been eaten away by the time and the elements, leaving huge gaps through which a gnarled tree branch curls and penetrates. Alan Mailland’s Grace (2000) is more air than wood, with thin streamers of locust burl swirling together to form the skeleton of a bowl and then exploding at the top into a form that resembles cirrus clouds. Some of the works in the show are aggressively illusionistic—Giles Gilson’s Cammy-Oh (2001) is made of basswood and pakkawood, but it’s smoothed and lacquered so that it looks like a glistening black ceramic bowl torn open—as if ceramic could tear like paper—to reveal an electric-blue interior. Artist Binh Pho covers the outside of his vessels with brightly colored figurative, narrative scenes that symbolically illustrate events in his own life, while Fraser Smith, in The Theory of Everything (2010), has created a fully trompe-l’oeil wood art experience, in which carved wood and silk dyes combine to make what looks for all the world like a colorful quilt hanging nonchalantly from a rope. All of this exuberant artistry is based on wood-turning, a technique in which a piece of wood rotates on its axis and comes into contact with a lathe, which removes some of the wood. Traditionally, the aim of wood-turning was to create a round form with a smooth surface in which the swirls of the grain are visible. It was ideal for bowls and other vessels for eating and drinking. 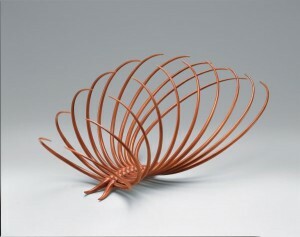 However, contemporary wood artists have turned this technology to their own protean purposes. Depending on the nature of the material, at what angle the lathe meets the grain, and the movements of the wood in the artist’s hands, a turned piece can assume just about any form and texture. And some of the artists superimpose other techniques, such as dyeing, veneers, carving, and even burning the wood. Some make heavy use of the natural imperfections of the wood, rather than trying to smooth them over or choosing another piece. Without a doubt, wood has been used for fine art before today. Think of the exquisitely naturalistic late-medieval sculptures of saints and sacred scenes by Tilman Riemenschneider or the profusion of leaves, fruits, and flowers coaxed from limewood by the 17th-century Dutch-English sculptor and woodcarver Grinling Gibbons, not to mention wooden pieces done by modernist sculptors such as Constantin Brancusi, Henry Moore, Isamu Noguchi, or Louise Nevelson. And of course, wood has long served the cause of fine art and illustration alike in the form of carved or engraved blocks for printmaking. Nonetheless, there is something distinctive in this emerging school of mostly American artists who take the craft of wood-turning as their point of departure and dwell lovingly on the nature of their medium with what the artist, furniture maker, and writer Eric Sloane called “a reverence for wood.” In a way, this group—by no means unified or formal—is analogous to the studio glass movement which also took off in the U.S. over approximately the same time period, the 1970s through today. 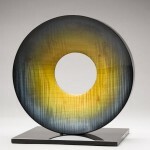 Like the glass artists, the wood artists start with a craft tradition rooted in vessel-making and take it far beyond into the realm of non-functional sculpture. It’s important to note that this movement is for the most part separate from the parallel movement of studio furniture, which also grew up in the U.S. (starting in the 1940s) and took cabinetmaking as its point of departure, though without abandoning functionality. The Montalto Bohlen Collection, from which the Peabody Essex exhibition is drawn, is more than just one collection among many. Put together since 1997 by a Massachusetts-based husband-and-wife team, Bob Bohlen and Lillian Montalto Bohlen, it is not only top-quality in terms of the actual works, it is also as much an expression of dynamic patronage as it is of collecting. The Bohlens not only acquired artworks, they commissioned them and even paid artists no-strings-attached stipends to give them the time and wherewithal to create works that the Bohlens would eventually acquire. Without compromising his aesthetic interest, Bob Bohlen, a real estate developer who used to be a cattle-breeder among other things, approached the task of collecting with a businessman’s acumen. Bohlen, who had already been a mentor within the business community and co-authored a 2010 book called Clarity: A 30-Day Foolproof Plan for Increasing Your Performance, Productivity and Profit, brought to the enterprise a, well, enterprising energy and set of tactics, not to mention clarity. In the catalogue, exhibition curator Dean Lahikainen writes, “Bob early on saw the need to elevate the field by helping emerging artists become better businesspeople in terms of how they produced and sold their work. To jump-start this process, the Bohlens put eighteen artists on their payroll for a year or more to give them time and freedom to develop their artistry, without the worries of making a living in other ways. In return, Bob and Lillian had the first opportunity to acquire the best examples of the artists’ works at lower prices.” This model, which Lahikainen compares to that of a Renaissance-era patron, stirred up some controversy in the tightly-knit wood world, particularly among dealers and collectors. An integral part of the Bohlens’ mission was to make sure that the artworks eventually migrated to museums, which would give the art form and the movement greater recognition, legitimacy, and critical attention. In 2000, just three years into their collecting, the couple donated 130 pieces to the Detroit Institute of Arts, which were highlighted in a show called The Fine Art of Wood. 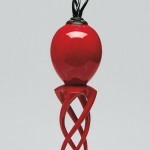 In total, the Bohlens’ donations amount to 820 works, which are now in museums including the Montreal Museum of Fine Arts, the University of Michigan Museum of Art, the Museum of Arts and Design in New York, and now the Peabody Essex, which in conjunction with the current exhibition is receiving 50 works for its permanent collection. 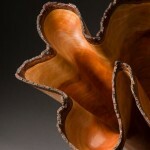 Wood artists work with a material that used to be alive and that retains many characteristics of living matter. In this art, there is no such thing as “dead wood.” To make work that is faithful to the material but not slavishly so, that takes the material’s growth lines and extends them—that is the challenge for today’s wood artist. And like the trees they depend on, their art is putting down roots and growing.